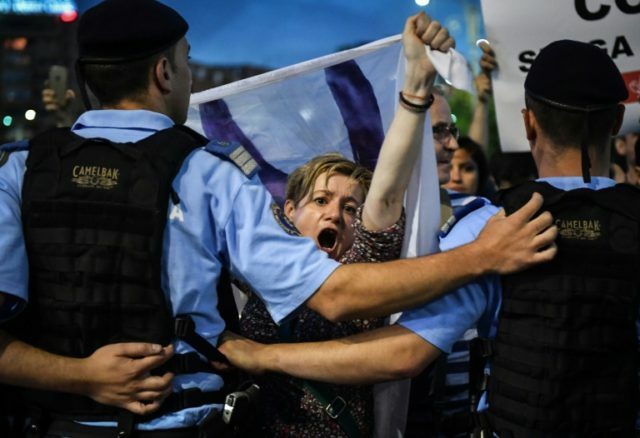 Bucharest (AFP) – Thousands of Romanians took to the streets Wednesday to protest against a relaxation of criminal legislation they believe will hamper the fight against corruption. Protesters in the capital Bucharest, where around 5,000 demonstrators gathered, chanted “We will not give in” and “Thieves”. Amid a heavy security presence, scuffles broke out with police several times during the rally. Officials said eight people had been arrested. The demonstrations came as the country’s parliament, dominated by the left, on Monday adopted amendments to the code of criminal procedure that the opposition says will protect offenders. The changes reduce the number of offences for which a person can be remanded and drastically limits the duration of investigation. According to centre-right President Klaus Iohannis, who has frequently clashed with the leftwing government, some of the amendments favoured Liviu Dragnea, head of the ruling Social Democrat Party (PSD). Dragnea could request a “review” of a two-year suspended sentence for vote-rigging which since 2016 has prevented him from running for prime minister. He is also facing prosecution for corruption over a fake jobs scandal. The High Court is due to rule on that case on Thursday. Romania’s leftwing government wants to sack the head of the anti-graft office, Laura Codruta Kovesi, for “harming the image of the country”. Critics say such moves undermine anti-corruption efforts in one of the EU’s most graft-ridden countries. Earlier this month Dragnea compared prosecutors to the Communist-era secret police, sparking an outraged response from members of the judiciary, who in turn denounced Dragnea for setting a “dangerous precedent” and for trying to pressure them.